Place potatoes in slow cooker. Bring water and 2 ½ teaspoons salt to boil in small saucepan. Pour boiling salted water over potatoes and stir to coat. Brush top layer of potatoes with melted butter. Press 16 by 12 inch sheet of parchment paper firmly onto potatoes, folding down edges as needed. Cover and cook until potatoes are completely tender, about 4 hours on high. Discard parchment. Mash potatoes with potato masher until sooth. Stir in sour cream, chives, and remaining 9 tablespoons butter. Season with salt and pepper to taste. Serve. Note: the top layer of patoates may discolor slightly, but this won;t be noticeable after mashing. 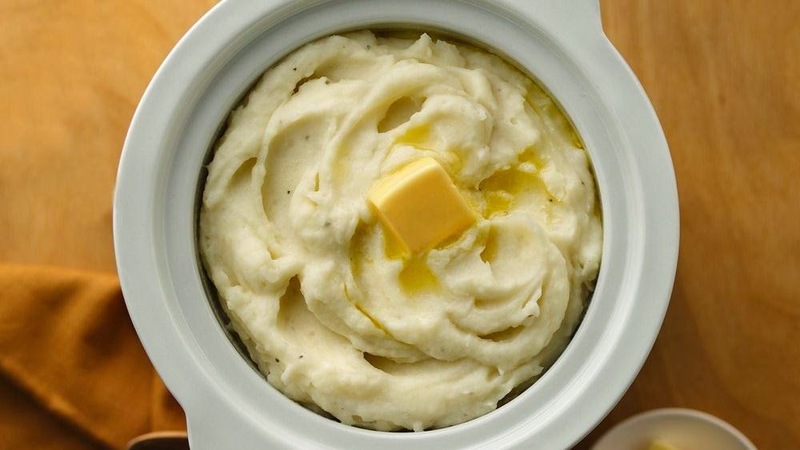 The mash may be held on the slow cooker’s warm setting for up to 2 hours before serving. Loosen the potatoes with additonal sour cream if needed.